Your above ground pool turned green. It’s bound to happen at least once or twice. There’s always a good reason. You got busy or went on vacation. The pump stopped working or the timer broke and you didn’t notice. Maybe you had a big pool party with a bunch of people who couldn’t control their bladders? Or, maybe there was a week of bad weather? Whatever the reason, the pool is now green. So, what do we do to get it back to that beautiful clear and healthy state? Let me help. Why Does a Pool Turn Green Anyway? The reason is algae. There are millions and billions and trillions of algae. When a swimming pool’s water is clear and you can see the bottom of the pool perfectly, there is hardly any life in the water. When a pool goes untreated or if the water doesn’t move around and doesn’t get filtered, it becomes an environment that’s conducive to the growth of living things. A pool that has favorable conditions for living things will start out with a little bit of algae. These algae are like pioneers with lots of land to share. They can reproduce in great numbers. Their offspring can breed too, so before you know it the pool gets a little cloudy. This cloudiness is an indication that the water is populated with living things and that this is becoming visible to our naked eyes. At this point the cloudy pool’s population is similar to the state of Florida’s population. A couple more days of growth and the pool starts to turn a light green color. When the pool is light green, you’ve gone from a town of pool algae to an entire city of algae. Another couple of days and the light green pool becomes darker. Now you’ve got New York City. Super dark green and your pool turns into NYC, Tokyo, Delhi, Mexico City, and Shanghai all stacked together. So, the greener your pool turns, the bigger the population of living things becomes. Nerdy facts, like why are algae green, I’ll leave to Bill Nye the Science Guy to answer. It’s only important to know that you’re dealing with something that must be killed and disposed of in order for you to get your beautiful and healthy pool back. Now you know your pool is green because it is overpopulated with algae and that the algae must be killed and eliminated. How do you do that? The short answer is to use a lot of chlorine in a short period of time. Or, in other words, shock it. Random pool guy definition: The term “shock” means introducing a large amount of chlorine to a body of water in a short period of time. Chlorine is the best because it can kill the algae and it does a great job of getting rid of it. Water Test Kits keep you aware of your water’s health. no one knows just how much algae each green pool has. The greener the pool, the more algae you have. 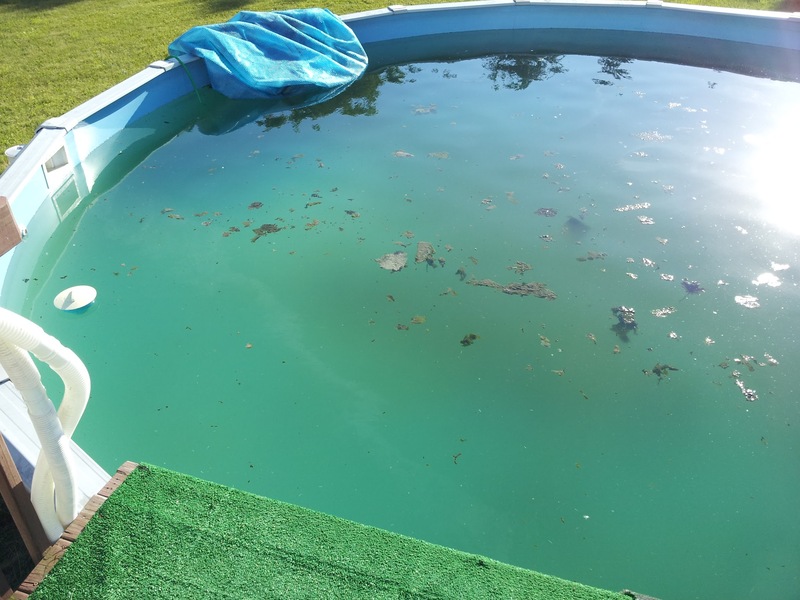 The more algae you have, the more chlorine is needed. It doesn’t take too much to kill all the algae, but it’ll take quite a bit of the chemical to get the dead algae out of the water. That’s really all I or anyone else can say about how much chlorine it’s going to take to clear your pool, because no one knows just how much algae each green pool has. Make sure the pump and filter are working properly. Check the water pressure that is going back to the pool and ensure it is strong. Clean the filter. Note: If you have a sand filter, I’m so sorry. This is going to take longer to get your pool back to clear water. Hopefully your chlorine level is at zero. If it is high, don’t add any more chlorine until the level is zero. This is important so just take my word for it and wait. Make sure the pH is normal or a little low. Don’t buy your chorine at Walmart or Home Depot. It’s old and overpriced. Go to a pool store to buy chlorine (get the yellow reusable 2.5 gallon jugs). Add only one 3” tablet to the chlorinator or floater.3(a) If you have a 24’ round above ground pool (or any pool larger than this size), add two of the 2.5 gallon jugs of chlorine. 3(b) If your pool is a 21’ round above ground pool (or any pool smaller than this size), add one 2.5 gallon jug of chlorine. Run the pool pump for 12 hours a day. Running the pump/filter for 12 hours will allow the dead algae to settle on the bottom of the pool so you can then complete step five more effectively. Vacuum the pool to waste. Do this after the pump has been off for at least a few hours. Vacuuming to waste will send all the dead algae completely out of the pool and into the yard which is ideal. If you can’t “vacuum to waste”, vacuum it anyway as it will still help (just not nearly as much). Repeat steps 2 to step 6 every day. You will have to repeat these steps at first. What’s most important here is that you wait until the chlorine level goes back down to zero or almost zero before adding more. As the days go by, there will be less and less algae to get rid of so you won’t have to complete these steps as often. Just curious why it’s important to let chlorine fall to zero before adding more? 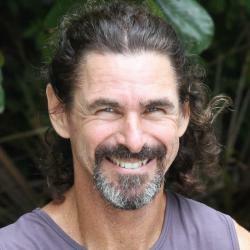 I got a green pool at the start of last summer and cleared it by shock-dosing the pool with chlorine once a day and running the salt-water chlorinator and filter on maximum for 24 hours a day until it was clear (took 3-4 days) – it sounds like I should have only run the pump 12 hours per day, and waited for chlorine to fall to zero before re-dosing – why is that? Wouldn’t it kill the algae quicker to maintain chlorine at a high level? Afterall, the algae grew when the chlorine was at zero, why would I want to let more grow when I’m trying to get rid of it? The cloudiness is probably caused by dead algae. You will need to continue filtering and cleaning your filter to rid the haziness. Here is a guide on chemical levels: How To Maintain A Swimming Pool Part 1 (Chemicals). The pH level in a pool needs to be maintained anywhere from 7.2-7.8. I’m afraid I’ll have to ask you to find and read my articles on maintaining above ground pools. Your question here would take too long to answer. I used to have green water after 4 days of changing the pool of fresh water. This happened for 5 months and been changing water 5 times. Shock the pool with chlorine and running the pump 24 hrs x 7 days but still not working. Finally we change the whole systems with the pump, filter and chlorination. It’s now been almost a month and the water is crystal clear. Diana…. What system do you use now? Never let your chlorine level fall to zero. That was about the worst advice I have ever read. 3ppm – 5ppm is the range you want to keep it at and if you happen to have lots of pool parties or your pool is in the middle of the Amazon, 7ppm is a better level to maintain. You are getting closer to a Chlorine Lock but unlocking a chlorine lock is a simple enough fix. Also, chlorine doesn’t kill algae, algaecides do. Chlorine feeds algae, as in algae eats it and prevents it from growing but it doesn’t kill it. 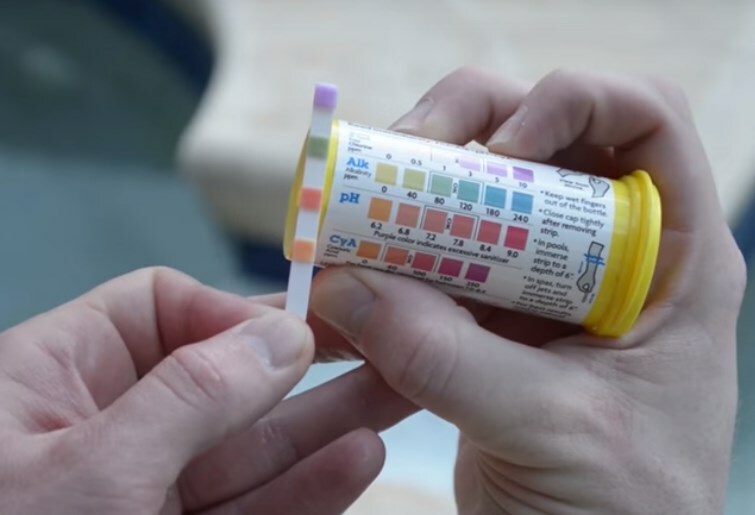 It is true that chlorine and PH work as you described and you would have probably done readers a better service by explaining that, instead of informing them to letting the chlorine level drop out. Phosphates are also another feeder of chlorine that will deplete the water of it. Testing for that is JUST as important as all the other indicators. Another bad thing for pool water is Total Dissolve Solvents and like a high calcium level or CYA the only way to fix that is to waste vac and replenish with fresh water and start balancing all over again. It has been my experience that adding everything at once is a bad idea. It is known as fall out. The water molecules simply can’t accept the flood of chemicals and block them out, creating fall out. Sodium Bicarbonate is a prime example, as is Shock .. in any form, save tablets or calhypo. Water evaporation is another way chlorine leaves the pool. If you are getting a suntan, you are losing chlorine. If salt or calcium are finding their way out of the pool, chances are ya gotta leak OR way too many people in and out of it. Peace out and P.S. I maintain 70 pools every summer and about 30 all winter and I have “turned” over 400 ponds back into pools. Glad you can reply as a professional. How about a little more info based on what you said here? If algaecides kill algae which ones do you use? What PH levels do you like? I mean don’t get me wrong I appreciate the help but you should provide a little more info if you are as good as you say you are. I never recommend draining an above ground pool. If you want though, you could drain it down to about one foot deep and refill. You’re still going to have to use a lot of chlorine to get it clear though. There is so much here that is wrong, I don’t where to start. 1. Ideally, the chlorine level should fall to zero. But only for a super short period of time. I suggested this because a homeowner is home every day and can detect when the chlorine level drops to zero quickly. Only allowing the chlorine level to drop to 3ppm will put the water at risk of building up combined chlorine which is really bad. 2. Chlorine absolutely kills algae. The health departments all over the country require a chlorine level for this reason. There is almost no mention of algaecides. As a pool guy, I haven’t used an algaecide for green algae in maybe 25 years. I understand why Curtis would think that though with his limited experience with pool maintenance. 3. High phosphate levels are extremely rare in most situations in most areas of the country. Especially for above ground pools. I almost never tested for phosphates but it could be an issue. 4. TDS and high calcium are other super rare occasions. TDS can be an issue in places that have a lot of evaporation like Phoenix but not in most places. Again, not something I would not look at until repeated shocking didn’t work. 5. I’m not sure what you are not adding all at once. If you mean shock, then that doesn’t make sense. As a pool guy, I am in a backyard for a limited time. There are some things that need time but most things can be added at once. Again, I think this is just a lack of experience. Maintaining 70 pools in an area that has a few hot months a year is a nice start to understand pool water chemistry. Personally maintaining a full route while managing hundreds more during the very long and very hot seasons of Central Florida for many, many years allowed me to run thousands of experiments in the realm of pool water chemistry. I did this mainly to help figure out how to maintain pools with less chemicals for more profit. This is where my knowledge base comes from. 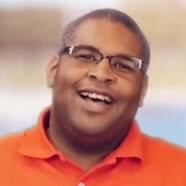 Mid-level pool guys like Curtis are prone to micro managing. I know I was years ago. I just bought a house with an above ground pool. It hasnt been used in 2yrs, the water is very green and it had tadpoles in it. If I partially drain it and dump shock and aglacide in it, will it clear up without hooking up the filter and pump? 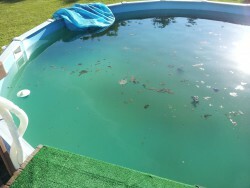 No, because part of the process of turning a green pool clear again is circulating water to filter out the dead algae. Also if you just add chlorine to a stagnant pool of water, the chlorine doesn’t get a chance to do the cleaning job you need it to. Article: How to Clean a Green Pool? How do I sanitize my green pool of frogs,eggs and tadpoles? How do I keep the frogs out of pool? You really can’t keep frogs from entering your pool BUT, I have only rarely seen frogs lay their eggs in chlorinated, clear water. So, you can avoid the tadpoles by keeping your pool clear, clean, and chlorinated. Poolside Chat Episode #22: Do I Need My Impeller Lock Screw?